Drop by the Visiting Writers Page to read their posts. I’m having a great time, doing school visits in and around Brisbane. On Monday, I did talks for students at Aquinas (Gold Coast), then at Marymount on Tuesday (also Gold Coast). Further north to Coolum State High on Wednesday, then back down to Mary MacKillop in Nundah, Brisbane today. 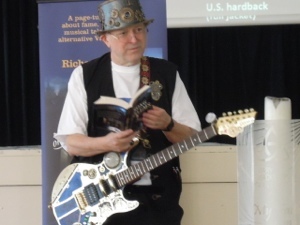 All accessories play a part in the ‘show’ – new pull-up banner, aviator helmet, goggles, Steampunk hat, book trailer video, PowerPoint – and of course THE GUITAR! I left my camera behind, so I only have photos from today – doing a reading while showing off my guitar! I have to share this! I took a secondhand guitar up to Lewis Morley in the Blue Mountains three days ago, and collected it from him on the start of my school visiting tours yesterday. 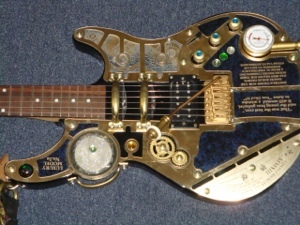 What he’s done is just amazing – it’s a steampunk vision! A work of art in gold and gadgetry! I knew he was good – now I know he’s an absolute magician! That globe on it even lights up with zigzag lines of lightning! I’m rapt beyond rapture! It’s not only perfect for SONG OF THE SLUMS – which tells of the invention of rock ‘n roll in the middle of the 19th century, a hundred years before Elvis – it actually plays too. Oh, I am going to have so much fun! We’re doing a Squee! for Felicity, regular ROR blog reader and guest poster. (See Fel’s post on using research to give authenticity to your writing. 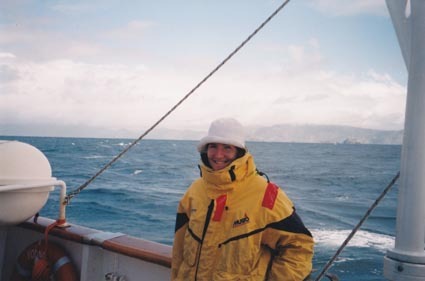 She talks about her time on the tall ship and a balloon ride). 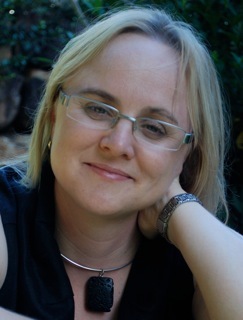 Felicity (writing as Louise Curtis) entered her book Heart of Brass in the Text Young Adult Fiction Prize. She was delighted to hear she’d made the final three. While her book didn’t win, this is an excellent result and we’ll be keeping our fingers crossed for her! For me, the most exciting bit will be the filming of a steampunk documentary. Michael Pryor and I will be doing a panel on all-you-ever-wanted-to-know about Steampunk, and filming will take place during and after the panel. Come in steampunk togs if you have any – or come anyway. “Would you like to appear in a Steampunk TV documentary? Simply, attend Michael Pryor and Richard Harland’s panel over the weekend at Supanova in Sydney. Filming will take place during the panel as well as an opportunity to be interviewed straight after the panel. So come dressed in your best outfit and tell us why you love Steampunk! Tell your friends and family to come along and make this event one to remember! Keep checking this page for confirmation of which day and room this event will be held. Paula Weston asks: Why aren’t YA books as respected as ‘adult’ books? 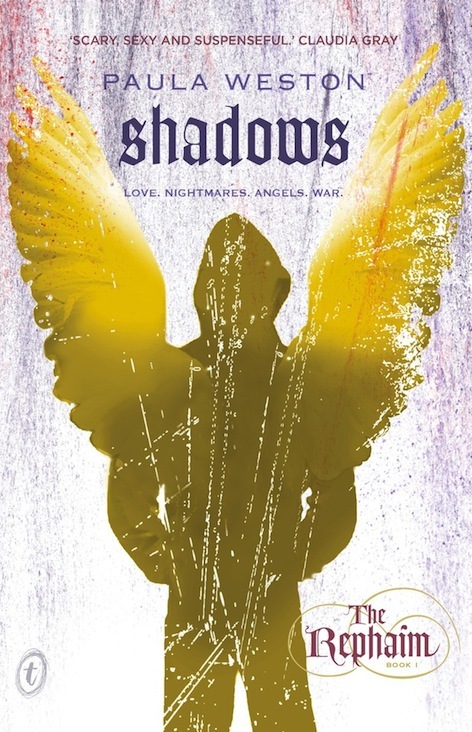 Today we have Brisbane based author, Paula Weston, whose debut YA fantasy Shadows has just been released from Text Publishing. Paula is going to talk about her passion, writing for Young Adults. She raises the question why are YA (and children’s books) less respected than adult novels. Watch out for the give-away question at the end. I don’t know who said it (or in what context) but I love that sentence. Not just because it justifies the amount of time I spend reading (and enjoying) young adult stories of all genres, but because it’s true. To suggest – as a Times magazine columnist recently did – that adults should only read adult books and leave everything else to teenagers, is remarkably narrow minded. His justification? Because ‘books are one of our few chances to learn’. In other words, there is nothing of value in young adult stories. In that case, why do we let our teenagers read them? The idea that a young adult novel is somehow less well written, less intelligent, less engaging and less capable of moving a reader, is insulting to writers and readers alike. Sure, there are varying degrees of quality among young adult books, but that can said of novels in any section of a book store or library. Like many writers whose books end up in the YA section, I didn’t set out to specifically write a young adult novel. Once I dusted myself off, I knew I needed a break from the pressure I’d put myself under to land a publishing deal. I just wanted to write something for fun, and that increasingly insistent idea in the back of my mind was the perfect outlet. So I started on a story just for me, not worrying about anyone would think. I wrote a few scenes, which became a few chapters, and suddenly I had half a novel. Characters had never come so easily and I’d never enjoyed writing so much. I sat down and fleshed out the plot in greater detail and realised I had a story that would take more than one book to tell (four in fact). My agent loved the idea, and those early chapters, and I suddenly had an exciting new project on my hands. When the wonderful folk at Text Publishing offered me that long-awaited contract, they felt the Rephaim series was young adult. The team there really knows what its doing in the YA market, and I was more than happy with that call. My only concern was that my series not be marketed to children or younger teens, given the amount of violence and profanity it features. I’m an eclectic reader – from literary to paranormal and everything in between – and I’ve consistently found some of my favourite writers on young adult shelves (Aussies Melina Marchetta and Markus Zusak, and US writer Maggie Stiefvater). Some of the best books I’ve read in the last 12 months have been YA (and written by Aussies), including Vikki Wakefield’s All I Ever Wanted, Leanne Hall’s This Is Shyness and Jane Higgins’ The Bridge (okay, Jane’s from New Zealand, but you get the picture). And if you don’t think YA spec fic stories can’t be complex and rich with analogy and metaphor, check out Marianne de Pierre’s Night Creatures series or Veronica Roth’s Divergent series. Certainly, some YA stories can have a lighter touch, particularly when it comes to dealing with sexual issues (compare the YA and adult paranormal novels of writers like Richelle Mead, Lilith Saintcrow and Kelly Armstrong), but others push the boundaries more than adult fiction. I agree there are boundaries that should be respected when the primary target is teens. But more and more, young adult novels are crossing over to wider markets. Harry Potter – still referred to in some quarters as ‘children’s fiction’ – sparked that fire, and it shows no sign of burning out any time soon. Absolutely, teens should own the YA section of book stores. But the rest of us shouldn’t have to feel like we’ve left our brains at the door when we want to read great stories that just happen to wear the YA label. Paula has a copy of Shadows for one lucky commenter. Give-away question: When you were growing up what YA novel (or writer) made a big impression on you? I recently embarked upon a boutique blog tour, to celebrate the international Kindle release of my Creature Court Trilogy. I had great fun talking about history, women, and some of the crunchier (and occasionally, sillier issues I came across while writing the Creature Court series, and fantasy fiction in general. I thought I’d put the links up here as well. If any new readers discovered me and my Kindlicious editions of the Creature Court books in recent weeks, do let me know! These things make authors very happy. Much gratitude to everyone who has written a review for the Creature Court books on Goodreads or Amazon, and an extra special multitude of thanks to the many awesome bloggers who let me borrow their space & their readership to help get word of my books out there. You all rock! I had to tear myself away from revision work on the latest novel (I’m really in the flow!) 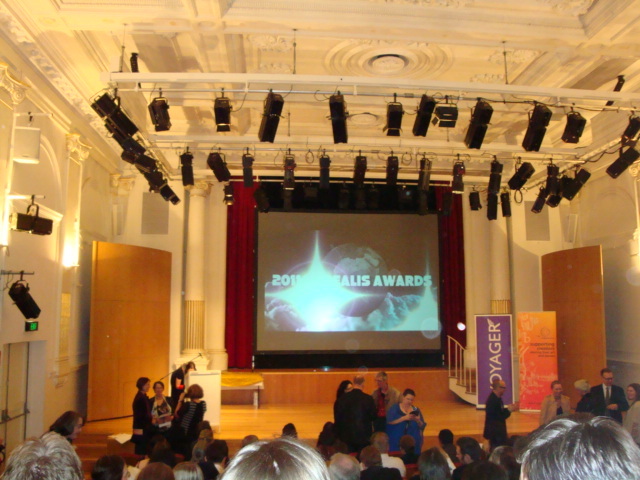 to go to the Aurealis Awards last night – but so glad I did! 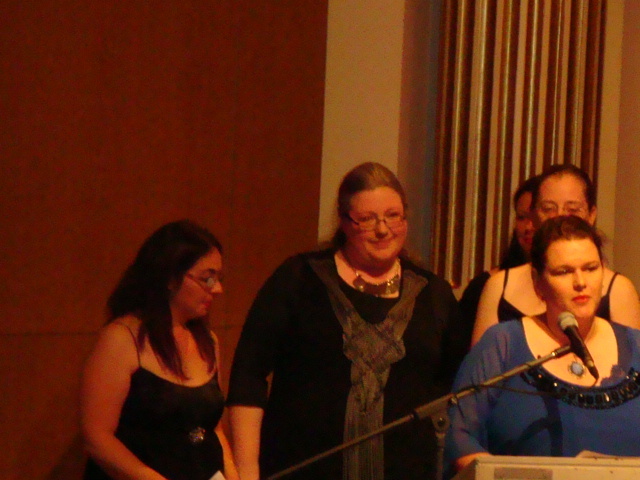 The turnout was amazing – people from every state, a who’s who of spec fic in Australia. I’ve never seen an Awards night better attended by authors and publishers. It was so great to catch up with friends! 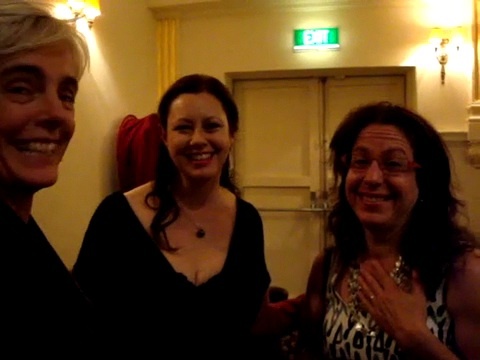 Our own Margo on the left there, Kate Forsyth in the middle and Kaaron Warren on the right. Alisa on the left, Tansy in centre, Alex sort of hidden behind Tehani Wessely. Tehani not only presented that award but was official judge-wrangler for the awards in general. Having a ball at Supanova! I had a ball at Supanova, signing Worldshakers and Liberators, and doing a joint presentation on steampunk with fellow Australian steampunk author Michael Pryor. I was a huge event – I didn’t hear final numbers, but on Saturday it was well on the way to being the biggest Supanova ever. Most of the guests were international, stars of TV and film, graphic novelists, all sorts of talents. It was exciting to sit in the Green Room chatting to them! The authors were mostly Australian, except for Brendan Sanderson, the American author who’s finishing off Robert Howard’s Wheel of Time series. [Whoops – quick revision – I had a brainsnap there – I meant Robert Jordan!} 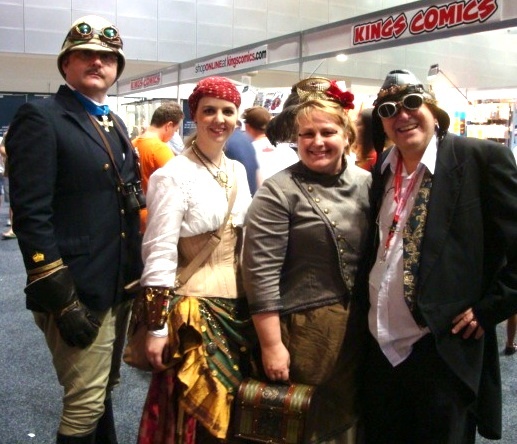 Our very own Trent was there – also Keri Arthur, Kylie Chan and my fellow steampunk author, Michael Pryor. Michael and I did a talk on steampunk – very well attended and approved enthusiastically. Steampunk is definitely making waves! I loved seeing so many steampunk costumes there! In fact, there were more the second day than the first – because people had been buying steampunk gear from the stalls around. For some classy steampunk costuming, here are Angela, Cherie and Michael (not the author) – plus me, not quite so classy because my shirt is hanging out. A real Victorian-era gentleman would probably die of shame if seen with his shirt hanging out! I’m wearing my aviator helmet and goggles in that pic, but I got to wear my new steampunk hat most of the time. It attracted a lot of attention, that hat! Here I am wearing it, with Michael Pryor who also dressed up in full steampunk regalia. I haven’t got a pic of all the authors at the signing table – I was sure I had, but I haven’t. Nor of Trent at the event – perhaps you can post one up, Trent? (Richard writes) I’ve been a hermit lately – a very productive hermit, finishing the next novel. 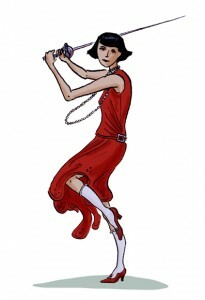 (Steampunk, of course – same world as the juggernaut books, but a different time and different characters.) Now I’m going to get out and about again – starting this weekend with Supanova on the Gold Coast. I’ve been invited as a guest, and so has fellow-RORee, Trent Jamison. It’ll be great to catch up, Trent – seems a long long time since we met outside of cyberspace. 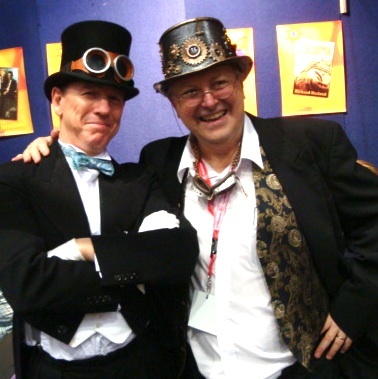 Michael Pryor and I will be doing a joint presentation on – of course – Steampunk! (Sunday at 3.15) Costumes and videoclips and readings and all sorts of wonderful things are guaranteed! Trent – if I can speak for you – I see you’re on at 2.40 Saturday with Kylie Chan, talking about Storytellin. How about that? I just hope it doesn’t topple over between now and Friday night. 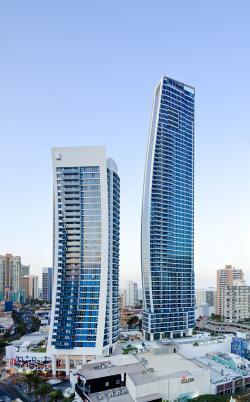 Supanova itself is in the Gold Coast Convention and Exhibition Centre at Broadbeach. The authors’ gang includes Keri Arthur, Bevan McGuinness, Brandon Sanderson (the American author who’s continuing Robert Howard’s series) and, I think, Alison Croggan, as well as Trent, Michael and myself. The media stars are even more dazzling, but still, that’s quite a show of authors. It’s going to be grrrrreat!